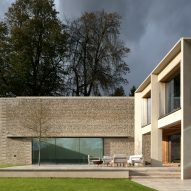 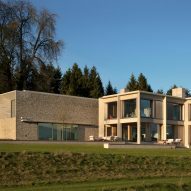 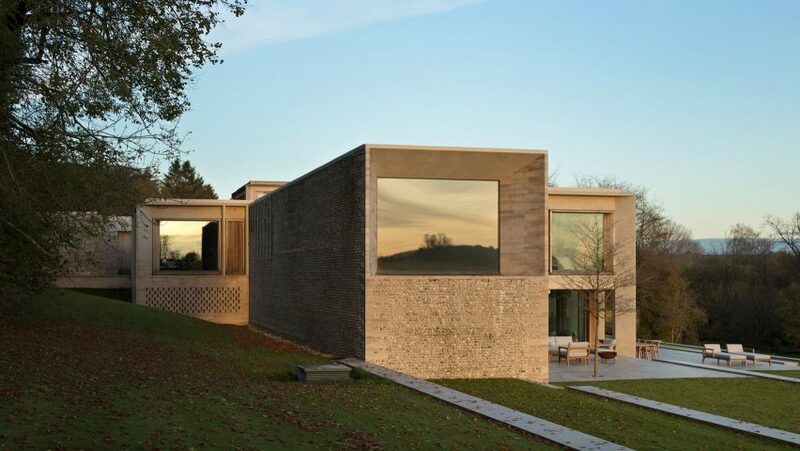 This country home, located in a river valley in Hampshire, was designed by Niall McLaughlin Architects as a series of stone pavilions. 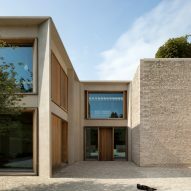 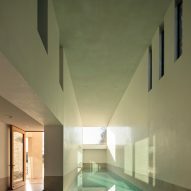 Nestled into a gentle slope, the 1,250 square-metre home's stepped, concrete-framed volumes sit against a long, flint-clad "inhabitable wall", which houses a swimming pool. 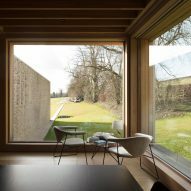 "The contrast of a load bearing, heavy, sheltering wall and framed, openable pavilions set sup a sense of difference that reflects the ned to screen the site from the north and open it towards the south and west," Niall McLaughlin, founder of Niall McLaughlin Architects, told Dezeen. 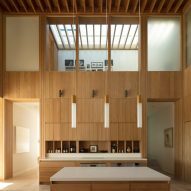 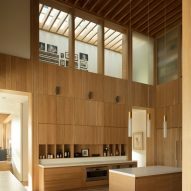 Despite its large size, the majority of the spaces of the home have been kept relatively small, with areas at the edges of the plan able to be closed off during quiet periods using large sliding doors. 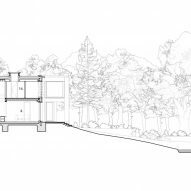 "The house can expand and contract," explained McLaughlin. 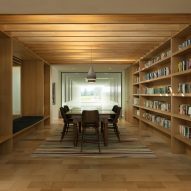 "On a busy weekend, it might accommodate parents, children, grandparents and a visiting family with their children housed in the bunk room." 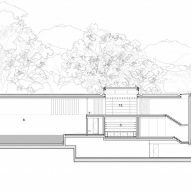 The plan is organised around a central, double-height kitchen, off which sit a series of communal living spaces. 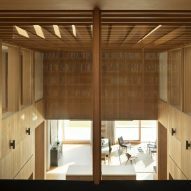 The stepped arrangement allows each of these spaces to overlook the surrounding landscape to the west and the south, with folding wooden screens to provide shading if necessary. 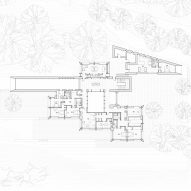 "We looked carefully at the plans of Katsura Villa in Kyoto, where the main building has a similar stepped plan allowing multiple rooms to share the view," said McLaughlin. 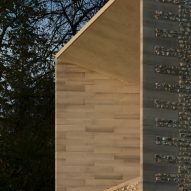 A purbeck stone-lined staircase with cantilevered concrete treads leads up to the first floor, where a central library space looks down to the kitchen below. 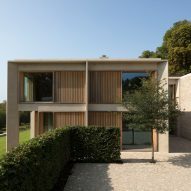 The more monolithic sections of stone and concrete are contrasted with timber, primarily French oak, which lines large areas of the interior and has been used for window frames and screens on the exterior. 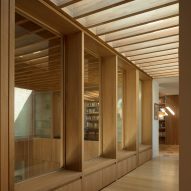 "I have always loved the combination of concrete and timber at Louis Kahn's Salk Institute," said McLaughlin. 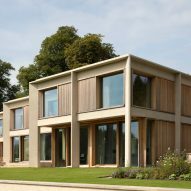 "As the oak turns grey in the weather, it will become closer to the concrete." 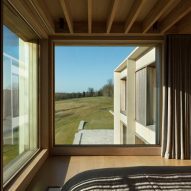 Contrasting the large communal spaces, the bedrooms on the first floor are all fairly small in size, but each still benefits from large openings overlooking the landscape. 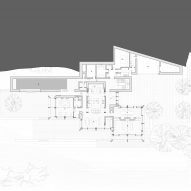 The site of the house is also home to a previous Niall McLaughlin Architects project for a Fishing Hut, able to be opened up in summer and battened down in winter.